"Bob had plea-bargained himself out of doing more jail time for possession of the hollow-point, cop-killer bullets. The system sent him to Ancorra State Mental Hospital because, clearly, he was (shape-shifter, smoke and mirror making) insane. But then, three months later, he acted himself sane (oh, how lovely and sometimes so, so simple to appear sane). And now. Now he stood before me while I worked as a food server at the Mays Landing Diner. I remember wondering if he got out of the mental hospital early, on good behavior, as he had gotten out of prison after a seven year stretch for the same ability to play the role expected that would best serve his needs. Bob did what he had to do to be free of the rule of law. Act like a good prisoner. Act like a sane person in the mental hospital long enough to be reprieved. Fool doctors, parole officers, whomever you have to. This was Bob's modus operandi. Get free to be free to return to insanity. Welcome to Bob's brain." This excerpt from my book, All Drinking Aside, illustrates how well some individuals are at appearing such and such a way to others. 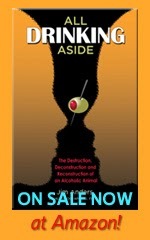 Under the influence of alcohol, I was not so clever or adept at hiding the insanity that is addiction. After the first ten years of my drinking career, my alcoholism had become apparent to anyone who glimpsed, even briefly, beneath the surface, behind my facade. By the second ten years of my drinking tenure, it had become increasingly difficult for me to even hide it from myself, obscured by layers of denial, as it were. Then, those last ten years, my surrender and abandonment to addiction, my victimhood, became fully entrenched and unstoppable. 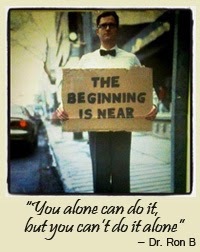 Hope springs eternal in this last quarter of my life as I battle cancer of the throat with a team of doctors. Glad I wrote my book, frankly, it has probably been more of a help to me than to my readers, but it is the gratitude expressed by my readers which will continue to help me continue to plod on, move forward and accept and deal with this progressive disease (hopefully, this cancer has been caught early enough). Learning in recovery to no longer be the victim of my addiction to alcohol and other drugs will serve me well in my struggle with cancer. Recovery has taught me to be responsible, to do what I can, to deal with life (and death) as it is served up to me. In less than a month I'll know if my seven weeks of chemo and radiation have left me cancer-free. But what about Bob? Where's Bob? I have no idea, but in the most twisted of ways, his insanity has helped clear the path ahead for my recovery, from alcohol, from cancer, from whatever my future may hold.